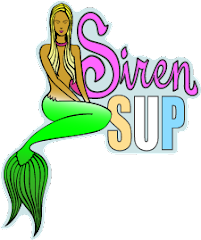 Every year Siren Surf Adventures anxiously awaits our return to the jungle surf paradise of Costa Rica. Pavones is such an awesome wave and truly is world class. The town ain’t too shabby either and we have made some amazing friends there. The more we visit the more friends we make. There really isn’t a place in the world quite like it. Famous for being at the “end of the road” yet feels more like you’re at the end of the world with it’s magical beauty and endless waves. We feel so lucky to have been invited to do what we do there and look forward each year to return. It’s not an easy place to get to but that is part of it’s charm. Once you’re there you feel cut off from everything that is going on in the world outside of the lush jungle. The only thing that matters there is what the waves are going to be like, whether or not you are going to see a sloth or run into some squirrel monkeys doing their daily swing to the beach for sunrise and sunset. Light showers work with the shining sun to cool off your day as you listen to a myriad of birds singing nearby. The howlers always give you a head’s up warning that rain is on it’s way while the thunder rolls a mighty roar and lightening X-rays the sky. It’s mango season and the trees throw the lovely fruits at you in bunches. Nobody pays for mangos…they’re free! Simply magical. Here are a few surf shots from this years 2016 Costa Rican surf adventure. Hope to see each one of you there next year! We guarantee it’s worth it! A hummingbird nest right outside the door of our cabin! Coach Kristy with a sneaky Noseride on her 5'2 Chris Birch Mini Simmons. 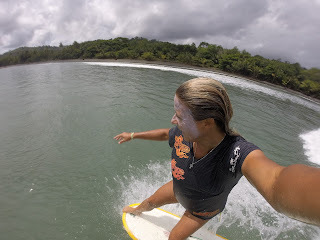 Our great friend, awesome surfer and the bestest massage therapist Tasia Jones! Coach Cat stalling the CJ Nelson noserider at our favorite left point. The Koto Cross Stepping down the point! Miss Carole getting her groove on a beautiful end of the road left!